OBDLink LX Bluetooth is an easy-to-use, inexpensive, hacker-proof, lightning-fast Bluetooth OBD adapter that can turn your smart phone, tablet, laptop, or PC into a sophisticated diagnostic scan tool, trip computer, and real-time performance monitor. The ergonomically designed, small form factor device comes in frustration-free packaging, and takes an average of 3 minutes to install. The button on the back of the unit makes the connection process both easy and secure: unlike most other adapters on the market, LX Bluetooth neither broadcasts its presence, nor uses an easy-to-guess PIN to protect the communication link. A potential hacker would require physical access to the device, in order to connect to it. LX Bluetooth supports all legislated OBD-II protocols, and works with all 1996 & newer cars and light trucks sold in the United States. It also supports EOBD, JOBD, and all other international variants of OBD-II. Based on the best-selling OBDLink MX, the budget-priced OBDLink LX Bluetooth offers the same unparalleled performance, delivering up to 4 times as many samples per second as the closest competitor. The ultra-fast response times let you enjoy accurate, detailed graphs and smooth, realistic virtual gauges. Consider purchasing MX if you need access to the proprietary Ford & GM vehicle networks (MS-CAN and SW-CAN) in addition to the standard OBD-II protocols. Check diagnostic codes yourself and make confident, informed repair decisions. Plug it in, leave it in — without the danger of draining your vehicle’s battery. Fully automatic sleep and wake-up: does not require switches or manual button presses! OBDLink app and OBDwiz are included with your purchase, free of charge! OBDLink LX Bluetooth works with all 1996 & newer model year cars and light trucks sold in the U.S., including all American, European, and Asian vehicles. Live outside the U.S.? Most newer non-U.S. vehicles are compliant with the OBD-II standards. 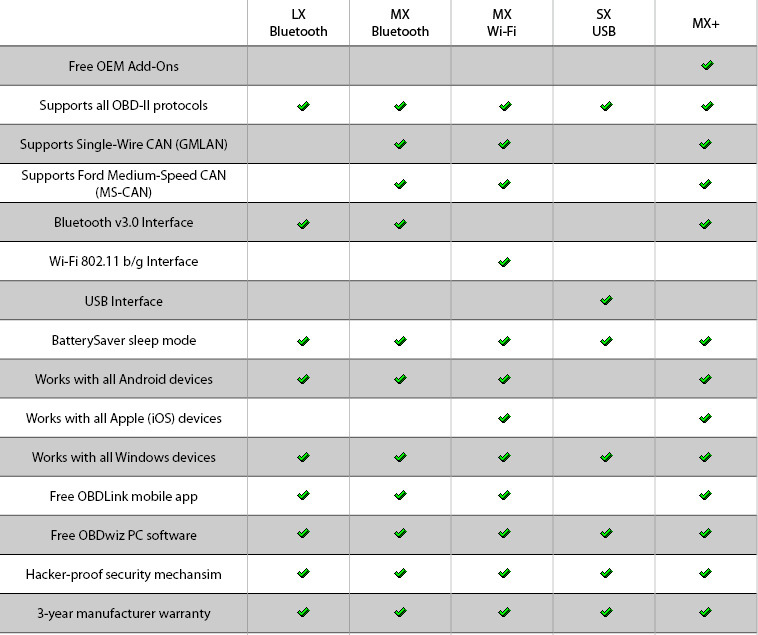 Check here to verify that LX Bluetooth will work with your non-U.S. vehicle. OBDLink LX comes with an unconditional 90-day money-back guarantee, and a 3 year warranty.